Welcome to the InfoCentrum na Ostrowie Tumskim in Wrocław website. 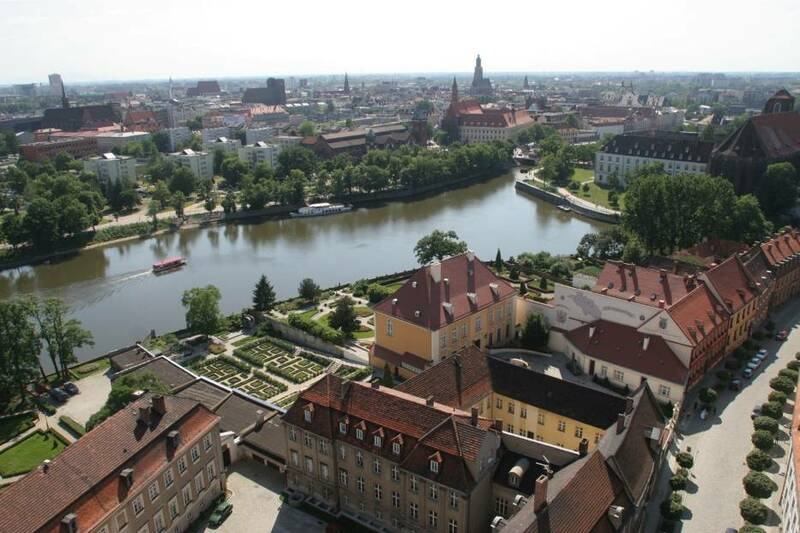 If you want to visit Wrocław, or if you are in Wrocław, we will help you to find yourself in our city. We have maps and cultural and religious information. We also have audiovisual materials to help you know the city better and aid you to sightsee Wrocław. We recommend a visit to our centre to watch a short movie „How Wrocław looked in the 16th century”. We invite you to our office on Cathedral Island- We are situated near the main entrance of the Cathedral. On our website you can find the most important informations about Cathedral Island sightseeing. See you soon at the InfoCentrum na Ostrowie Tumskim! InfoCentrum offers city guides, tour guides and mountain guides. We can arrange an appointment with these guides for your visit to the city and to Cathedral Island (Ostrów Tumski), or another place. The Cathedral is not available for visitors during religious services (diocesan celebrations, weddings, funerals). Please do not visit the Cathedral at this time. Groups can sightsee the Cathedral only with an audio-tour system to respect the silent atmosphere of the Cathedral. Organized groups are a minimum of 10 people not including the group's guardian. the observation deck is closed. In case of bad weather conditions the observation deck is closed. Baroque chapels are unavailable for visiting during the religious services. The magic and charm of Wrocław's Cathedral Island is the result of a very rich and interesting, if not tragic, history of the region. Among other things, the island is famous for housing numerous medieval and baroque style artefacts and remains. The Cathedral of St John the Baptist in Wroclaw is said to be one of the most important and beautiful churches within the archdioscese of Wroclaw. It is often described as the mother of churches, as it belongs to four of the oldest cathedrals in Poland. The present day Cathedral lies on the original shrine built by pagan inhabitants of the island, dating back the 10th Century. This place of worship was made of stone and planned in the shape of a cross. The first Cathedral was built in the early 11th century, after the rise of the Bishopric in the year 1000. It was a Basilica beyond imagination at the time. The second Cathedral was built in the place of the initial Cathedral, after it was destroyed at the end of the 11th century. It was a Romanesque Basilica with a transept and a square choir space (also known as chancel) closed with an apse. The third Cathedral was an extension of the second, also in the Romanesque style, as a Basilica with a transept and nave. It was finished with a western facade with two towers. The present day Cathedral, built in a gothic style, dates back to 1244. In the years 1244-1272 a choir of the Cathedral was built with an ambit (added to the existing Romanesque Cathedral). At the beginning of the 14th century, the construction of the Gothic nave of the Cathedral (in place of the Romanesque) was begun, and in the years 1354-1361 Marian Chapel was erected. In 1416, the construction of the northern tower with the helmet in the west façade was completed. In later years, the Cathedral was rennovated many times. In the years 1556-1580 renaissance helmets were erected on the towers of the west facade. In the years 1671-1672 the Chapel of The Most Holy Sacrament was built. The construction of St Elizabeth's Chapel began in 1680 and was completed in 1700. The construction of the Corpus Christi Chapel ran from 1716-1724, and the construction of the All Souls Chapel (now known as the Resurrected Christ Chapel) began in 1749. In the 17th and 18th Centuries rennovations of the interior of the Cathedral took place. These rennovations included the side Chapels and altar itself and many epitaphs. In the 20th Century the old casks on the western towers were finally replaced, after being destroyed in a fire in 1759. The construction took 180 years. The Cathedral suffered the greatest damage during the siege of Wrocław at the end of World War II. The damage was so great (75%) that it was wondered if it was even possible to rebuild the Cathedral. After the wartime destruction, the Wrocław Cathedral began to be rebuilt in 1947. The works lasted until 1951. Many elements of the interior design have not survived until present times (they were destroyed as a result of war activities). Part of the decor (by decision of the communist authorities) was taken outside of Wrocław. Some elements of the current interior design of the Cathedral come from other churches in Wrocław and Lower Silesia (eg. stalls or gothic setting of the main altar or an organ instrument transferred from the Centennial Hall). New elements of the interior were also made - including stained glass windows. Since the end of the 20th century continual restoration and conservation of the Cathedral is taking place. For instance new tower helmets have been erected in the west façade, conservation of the facade of the towers has taken place, and maintenance as well as reconstruction of the stonework and architectural detail have been carried out. Inside the Cathedral, altar settings (including a gothic polypty in presbytery) have been retained, paintings in the presbytery, gothic frescoes in the ambiance and baroque chapels with frescos, some Gothic, Renaissance and Baroque epitaphs, stained glass windows and many other interior design elements have been conserved. All these works were made so that the Wrocław Cathedral would acquire the splendor and beauty that its builders intended. Collegiate church the Holy Cross is a two-story gothic temple founded by Prince Henry IV Probus in memory of the end of the conflict with Bishop Tomasz II. The Church became the burial place of its founder, who was buried in a beautiful gothic sarcophagus (now in the National Museum of Wrocław). The lower Church St. Bartłomiej was erected in the years 1288-1295. The construction of the upper Church of the Holy Cross was begun in 1320, and finished 30 years later. The Church of the Holy Cross (and the lower church of St. Bartholomew) was built on a cruciform plan with a three-nave transept. In the VXIII century, the Church of the Holy Cross was given a beautiful baroque decor, which was destroyed during World War II (destroyed in 25%). As of 1288, the Church served as the seat of the collegiate chapter, which was dissolved in 1810, a secular decree of the Prussian government. The Chapter was reactivated by Fr. Cardinal Henryk Gulbinowicz on September 14, 1998. In 1946, works to secure the Church (as part of the reconstruction and conservation) began after its damage during the Second World War. After 1957, the entire upper Church was rebuilt. In the 90s and at the beginning of the 21st century, many conservation, renovation and aesthetic works were carried out: the entire roof covering was replaced, a new organ was installed in a new prospectus, new canon stalls and a new plaque commemorating the collegiate chapter (including: Mikołaj Kopernik - a member of that chapter). New paintings were also painted to set the baroque altars in the transept and new interior lighting was installed. The premises at the sacristy for the chapter house were thoroughly renovated. All the works that were done restored the former splendor of the collegiate Church. The first Church, St. Peter's was erected in 1175 as a Chapel of the Cistercian abbot from Lubiąż. The current Church (in the Gothic style, single-pillar) was erected in 1454 (in the first stage in 1404 a presbytery was built). From 1512, the Church was dedicated to St Peter and Paul. In 1634, during the fire of Ostrów Tumski, the roof and Church vaults were burnt. It was rebuilt over 30 years later, in 1667. After the construction of the orphanage (in the years 1702 - 1715, in the Baroque style), the Church served as the "Orphanotropheum". During the war (World War II) the Church of St Peter and Paul was 60% destroyed, but after the war it was rebuilt. In the 90s of the 20th century, the interior of the Church was renovated (a new cathedral style was also created) and the arrangement of the presbytery wall with the Gothic triptych. From the seventeenth century to the beginning of the 19th century, Church services were held and sermons were preached in Polish. In the communist times, the Church was in charge of academic pastoral work, which included pastoral care of many intellectuals - later luminaries of post-communist changes in Wrocław and Poland. Church St Giles is the oldest temple erected in the Romanesque style at Ostrów Tumski (and in Wrocław). It was built in the first half of XIII century with a a single-aisle, two-spans apart. It has a square presbytery finished with an apse. It is covered with a cross vault, and the nave is a Baroque vault from the 18th century. The Church St Giles - until the secularization in 1810 - served as a parish Church for the inhabitants of the Cathedral area. It also served as the Church of the Bishop. During World War II, the Church was 15% destroyed, and it was rebuilt just after the end of the war. Conservation works were carried out in the years 1952-1953 (among others, the exterior elevation plaster was removed), in the years 1969-1971 (the interior of the Church was reconstructed - the original look was restored) and at the beginning of the 19th century the roofing was replaced. Currently, the Church serves as a Chapel for the youngest children from the Cathedral parish.